You are here: Home / Article Knowledgebase / Now this is a planetary talisman. Baffling wondrous and extremely rare in Nature-Sattvik Brahminical Cat’s Eye Chrysoberyl with 3 Chatoyant Bands- A wondrous feeling and Yes top quality gemstones choose an Individual! What exactly is a Brahmin Cat’s eye! Now this is a planetary talisman. Baffling wondrous and extremely rare in Nature-Sattvik Brahminical Cat’s Eye Chrysoberyl with 3 Chatoyant Bands- A wondrous feeling and Yes top quality gemstones choose an Individual! 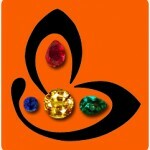 What exactly is a Brahmin Cat’s eye! Now this is a planetary talisman. Baffling Wondrous and extremely rare in Nature-Sattvik Brahminical Cat’s Eye Chrysoberyl with 3 Chatoyant Bands- A wondrous feeling and Yes top quality gemstones choose an Individual! Comments Awestruck! Yes that was the feeling we got once this Gemstone was set and came in the galleria after consecration in the temple. The feeling is indescribable to even have the good fortune to view this sacred gemstone. Yes, it is so rare, so pure, so magical. Chances 1 in a 1000. The moment it was put in our galleria under Yellow Light it underwent a transformation and we saw one of the most fascinating sights. The full play of the optical phenomena of Chatoyancy and Chatoyancy that is considered in the Shastras to be the very BEST-Yes, The best. 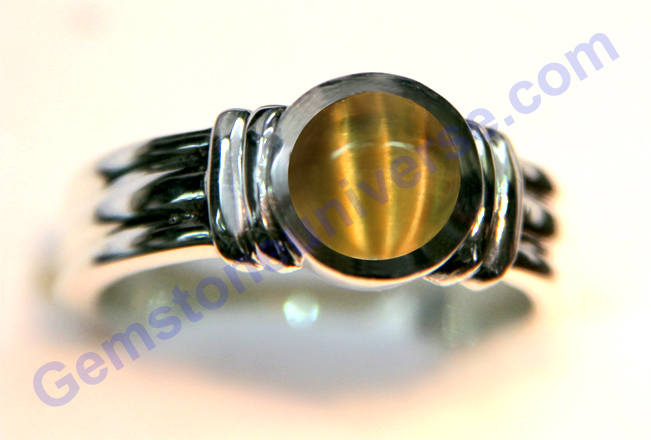 What makes this Cat’s Eye Chrysoberyl so special is the full 3 chatoyant bands running end to end? A Cat’s Eye with a Yellowish Green hue and full 3 lines is known in the sacred texts as the Brahaman Vaidurya– A Cat’s Eye of the Brahmin class. It is supposed to be either for the elite, the chosen ones or the very blessed as this one is so rare in nature and has the full 3 lines. The 3 Chatoyant Bands are like the Brahma Sutras/ Janeu/ Sacred threads worn by the Brahmins who have the blessing of the knowledge of Vedic Texts. A Brahmin Cat’s eye brings so much good luck and benefits that it is difficult to put in words. When this piece was uploaded and pictured we did not notice this phenomenon to this level. You can see the original picture of the Gem by clicking the link below. Once set this came out as premium collectible quality and could have retailed at normally 8-10 times the price the gem was originally listed. But Good, Sattvik Gems choose the individual with whom they want to remain and empower and such Sattvik gems reach their true owner regardless of price, circumstances or anything. Truly mindblowing, truly special. Goes to a patron who has already implemented a portion of Gem therapy earlier in 2010 using unheated and natural gemstones. The patron had ordered a different Cat’s eye but that order was not placed successfully. The very next day this single piece of Cat’s Eye was listed and second time around there were no errors. She bought this one or maybe It went to her.